Many grape growers in the Sonoma. Mendocino and Napa Counties have had fire move through or around their vineyards. Most growers have experience installing erosion control measures and a good sense of what to do to protect their vineyards. There are 6 goals of post fire erosion control. Click the link below to access the tips and goals. Labor Commissioner letter to FLC’s regarding SB243 – effective Jan 1, 2012 Note: Example template is example only. Not all information on example template is required by law. For more information, please view AB243 Cheat Sheet on Saqui Law SCWC Members Area (link above). USDA, NRCS 2012 Program Sign Ups! Attn growers: EQIP can fund a Weather station that is added to the SCWC Weather Station Network that supplies local weather data to the Western Weather website for Sonoma County. 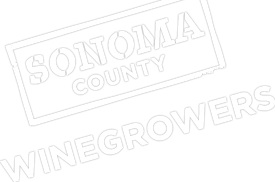 Grading, Drainage & Vineyard/Orchard Site Development now handled at the Sonoma County Ag Commissioner’s Office not PRMD. Changes to tree removal have been implemented. For more information, please contact Ag Commissioner’s office.